At a time when more and more jobs require a bachelor’s degree, a new report released today by the Mayor’s Office of Workforce Development suggests that many Boston workers without a four-year degree possess the necessary skills to fill these jobs—and could fill more with the help of credentialed education and training in high-demand industries. 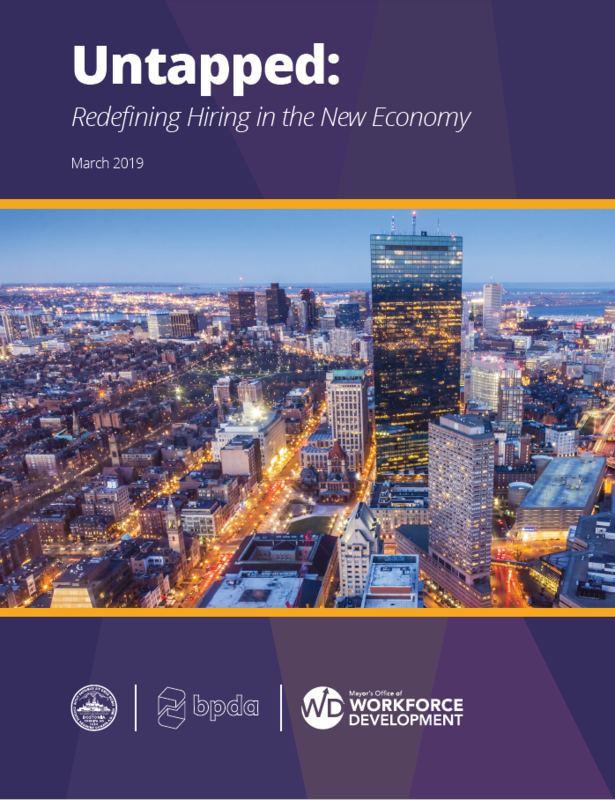 The report, Untapped: Redefining Hiring in the New Economy, comes at a unique moment for Boston’s job market. Since the Great Recession, an “upskilling” trend has led employers to raise educational requirements for jobs that once did not require a bachelor’s degree. While nearly 60 percent of Boston residents hold a bachelor’s degree, the city’s historically low 3.4 percent unemployment rate has left employers in need of more skilled workers to meet job demand. The Mayor’s Office of Workforce Development will be following up on the report recommendations, which focus on employer-informed credentials in high-demand fields, increased completion rates at community colleges, improved vocational career pathways, and expanded language instruction and job training for immigrants. Read the full report or read the press release to learn more.